For over 15 years, BMA's principal managed all aspects of the utility supply relations with over 200 individual service providers for a major retailer having 300+ retail outlets and several industrial campuses. Starting with discussions about your customers' unmet energy needs, BMA can help you look deeper into your customer relationships so that you can develop products and services that they will actually buy and use. Today, few of your customers have the resources, time, or interest in learning the complexities of your industry - they have their own battles to fight. They simply need to minimize their utility spend, whether through rate reductions or usage reductions. And you can enhance your own revenue stream by helping them succeed. The following screens describe a suite of executive consulting services that examine certain aspects of your current business model, with the aim of better aligning your offerings to the financial needs of your key customers. 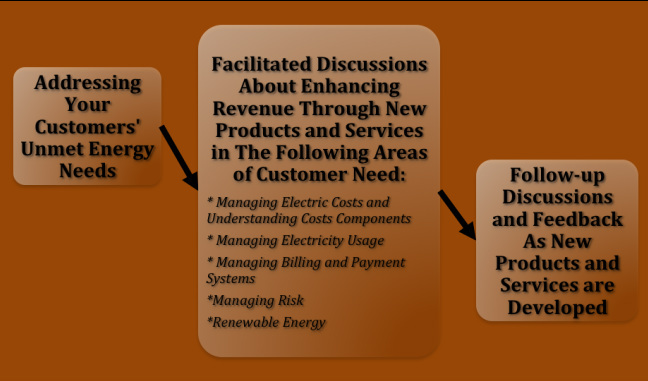 Examples of value-added opportunities for your customers will include risk management policy guidance, usage and cost data mining and reporting, billing and payment efficiencies, and the how and why of renewable energy purchases.